For any kind of event or special occasion you are planning, our Custom Event Wristbands are the perfect solution. 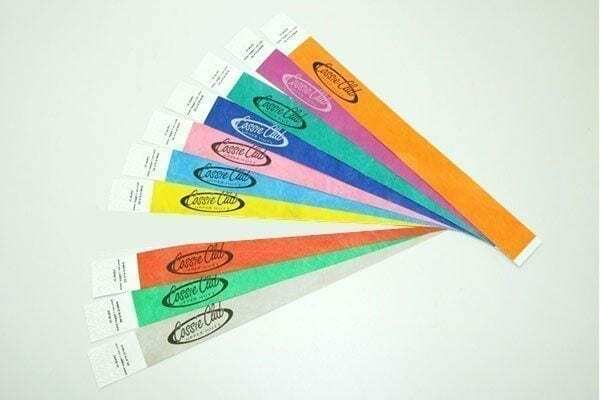 Our custom tyvek wristbands are made of waterproof, stretch and tear resistant material, these wristbands can be made in various sizes including 3/4 inch and 1 inch variations. With the special adhesive and die-cut closure, they are tamper proof so you do not have to worry about gate crashers or people reusing the band after issuing to one person. If your hosting an event getting custom event wristbands is a must! To make it even more interesting, these tyveck event wristbands are available in a wide variety of colors that suits your event without fail. According to the needs of clients, we can print them in custom colors to make your event memorable or just use one color. 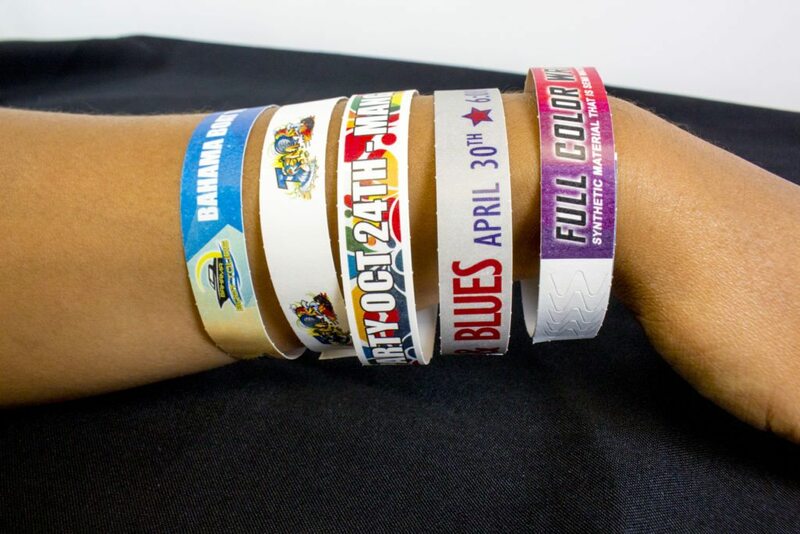 The multicolor band is common when a company logo is to be printed to enhance marketing of the event even after it is over. They can be designed to reflect the event or company with relevant text and colors and any other information that the clients would want to be printed for the guest’s wrist. We can print variable data with variable qr codes and barcodes as needed. The pricing usually depends on the custom tyveck wristbands variations and any extra work the client may want to be included with the most basic of designs and colors being cheapest. Other than the custom tyveck wristbands, we also make imprinted silicone bracelets and vinyl wristbands to serve different needs of clients. Once the order is made and design approved by the client, we can print them in as little as 1 day and start shipping. No order is too big for us or too complex since we have the best professional staff and a very efficient system to print the orders in time for your event. In the entire industry, we offer the best turnaround time for you. We can ship custom orders as early as the next day after the order so nobody can beat our fast delivery. With our wide selection of styles, colors and material including tyveck and vinyl for security identification and silicone for promotional purposes or cause related events, we can cover almost anything a client needs. There are hundreds or design options and colors for the varieties of event wristbands. – It is an easy process in preparing for your order and creating the prefferd design you want to be printed on the wristbands. You can give us your own design and logo in various formats and instructions on which colors to be used. Note that the more the number of text to be written on the wristband the smaller their size will be on the wristband. – After receiving the instructions and preparing to print we will send you an email so as to get your approval before we begin printing process. – If you need the custom tyveck wristbands by a specific date then it is advisable to contact us in time so as to check if the timing is possible with our schedule. If your local stop by our show room at Top Class Signs and Printing Miami Location to see samples.